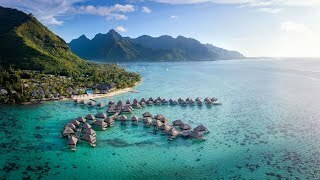 Get to know Hilton Moorea Lagoon Resort & Spa through this exciting drone footage. 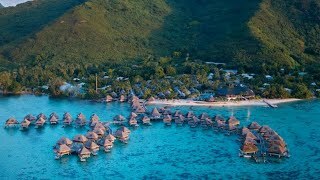 Hilton Moorea Lagoon Resort & Spa, the only 5-star resort on Moorea, is located in front of the lushest coral garden of the island with beautiful views of the lagoon. One of the resort's unique spots is the famous overwater Toatea Crêperie & Bar. Toatea is the perfect venue to admire the dance of sharks under the pontoon while sipping cocktails at sunset or enjoying crêpes from Brittany. The resort offers complimentary WiFi throughout the property. From nautical activities such as snorkeling, paddle boards are free to inland sports activities you will be free to create your own active program enjoying every minutes of your stay. Our fitness center and our tennis court are available 24/7 so you can easily accommodate your program around relaxing moments on the beach and cultural activities. Explore the unique services and amenities at Hilton Moorea Lagoon Resort & Spa. French Polynesia has long been recognized as one of the most romantic destinations in the world and Hilton Moorea Lagoon Resort & Spa, one-and only 5-star resort on Moorea, is the perfect retreat for those who have romance in their heart. 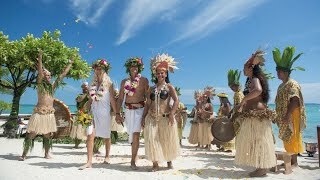 Hilton Moorea Lagoon Resort & Spa can organize and host wedding receptions and vow renewals — tailored to suit the tastes of those seeking an unforgettable, once-in-a-lifetime moment — on the white sand beach facing the stunning blue lagoon.